Note: Psalm 95 appears infrequently in the Lectionary (Lent and November in Year A). This post updates the rather scant coverage of a 2014 post. Writing a psalm that urges us to sing psalms seems a bit like blowing your own trumpet; but we assume many of these songs were familiar as part of the culture of the children of Israel from the days of the exile in Egypt. So the song dips back in time to remind the reader of those trying days in the wilderness that form the backdrop to Lent, after Pharaoh let the people go – into freedom from slavery, sure, but also into the wilds, deserts and privations. When read in Lent, the preceding Old Testament reading is from Exodus 17, the people complaining of their wilderness thirst. Similarly, Australia’s heartlands can be both impressive and fearsome. The psalmist goes on to remind us that trials and hardships pass; do not to take the short view, for in the long run we shall find peace. The song is an encouragement not just to be thankful but also to be humble and not to ‘harden our hearts’. TiS 53 is the Calypso Carol. A simple refrain from The Emergent Psalter using verse 1 may be a good choice: “Come let us sing, let us shout for joy”. The first, 95C (Come let us sing), is a chant by William Boyce in the form of an unusually long double tone. This would suit more traditional tastes very nicely. While the harmonies are not adventurous, it can be sung in SATB to rich effect. Over the page, PFAS 95E (O that today) is a lilting tune in E minor by Andrew Moore, with a choice of two tones for the verses. A couple of features make this refrain attractive. First, it flows up and down nicely to finish on the tonic major. Next, both bass note and chord sequence follow a loose stepping pattern down then up, in either a single or double-step (thirds) fashion. This means little when written thus but the musical effect is pleasing. You have to be there. Finally, an oboe descant part featured in “Let not your hearts be hardened” at 95I promises a nice song, including refrain and sung verses. For the more adventurous, a swag of classical setting of 95 may be found in the public domain, including a smaller but still impressive swag of tunes from a shoe-maker, Thomas Clark (1775 – 1859). Clark, who according to his obituary “received but a scanty education, but was an incessant reader”, was also an incessant composer. You get the picture when, while scanning page upon page of titles by this director of music in Canterbury, the eye falls on A Twelfth set of Psalm Tunes. Being in the form of rather conservative hymns, they do not earn a prominent place in our repertoire. Elsewhere in the big swag, a piece by Michael Praetorius (1571-1621), impressively entitled “Venite exultemus Domino: In festo Natalis Resurrectionis Ascensionis” (being the incipit and seasonal use), is remarkable for its arrangement for nine parts in three trios. Each voice was published in 1607 as a separate book. As is his way, he directs that these parts may be for voices, instruments or organs. 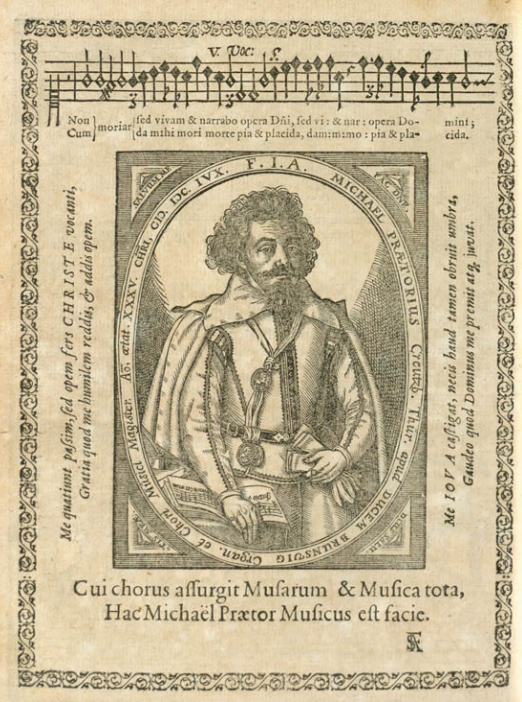 Septima vox, Musarum Sioniarum (1607), Praetorius. Danish Royal Library.